These guys are the best in the business. When I was finally ready to go under the knife, these were the guys I called. The consultation is very thorough. They take their time & answered any question I had. They want YOU to be happy. It's been a few years & I love the way things have settled. I refer them people all the time. It's absolutely worth the money. 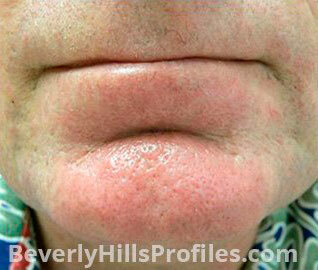 Facial redness is a concern for many of our Beverly Hills patients. This problem can be caused by a variety of factors, including broken blood vessels, rosacea, and acne. Broken blood vessels are one of the leading contributors to facial redness and, fortunately, one of the easiest issues to correct. Our team of Double Boarded Facial Plastic Surgeons have extensive experience in using the advanced IconTM Aesthetic laser system to aggressively and effectively minimize the appearance of broken capillaries and facial redness. It works by targeting red pigment beneath the skin, such as that found in problematic vessels and veins. The laser energy causes blood vessels to constrict so they are less visible beneath the skin, thereby reducing facial redness. The laser system is calibrated to targeted only red pigments, so surrounding skin is not damaged, resulting in a quick recovery for our Los Angeles patients. It is important to understand that lasers are the tools for the treatment but it requires experience and expertise in the use of these lasers to most effectively treat your skin and to get the best result in the least number of sessions. Male patient with pigments on chin. You will probably require more than one treatment to completely eliminate facial redness, but you should see a noticeable improvement after your first session. Most of our patients do not find the treatment painful, but a numbing cream can be used to minimize discomfort if needed. Icon Aesthetic is a non-invasive treatment that causes few side effects. You will be able to resume normal activities immediately and can use makeup to conceal any lingering redness. What Causes Broken Facial Vessels? 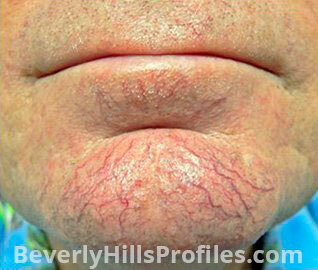 Also referred to as broken capillaries or spider veins, the medical name for this condition is telangiectasis. It occurs when capillaries (the smallest blood vessels in the body) enlarge or dilate, causing them to become visible beneath the skin. When several smaller vessels are damaged, the entire area may have a perpetually reddened or flushed appearance. Damage to larger vessels can result in pronounced red or purple lines to appear on the face. Where do Broken Blood Vessels Appear? Capillaries can dilate or become enlarged anywhere on our body. They are most often seen around the chin, nose and cheeks because the skin in these areas is particularly thin and delicate. There are also more blood vessels running through the face and this area of the body receives the greatest amount of sun exposure.